Happy New Year! I didn't do anything on NY Eve other than go over to a friend's house to play some games. I was actually home by 11pm. Party animal I am not. I'm very hopeful that 2013 will be a year of fabulosity and I'm excited to see what's in store for me. I started the year off right by making pork dumplings, banana bread and doing a lot of ironing. Here's to productivity and controlling my destiny! Winter is here with a vengeance. -23C (-9F) today with the wind chill. My house is heated by hot water baseboards which tend to freeze when the temperature dips below -15C so before leaving for work this morning I cranked my heat to +22C. Even with that it's only 19C in my house right now. Chilly! I might have to put my electric blanket on my bed tonight. Cold days call for a wool dress. I can't believe it's been over a year since I've worn either this dress or these boots. Seems like a shame. I wasn't sure they would go together well but I wore the boots for added warmth in the office. My office has two walls of windows so when it's well below 0 it tends to get a little frigid. I think I need to replace this cardigan since it doesn't hang well anymore. And it's just crappy cheap cotton so it's not even slightly warm. I wish I could have worn the dress without the cardigan but there was no way that was happening today. This is a nice warm dress but it's best feature is POCKETS. My sister bought me this brooch on a recent trip to Australia. It's from a design studio called "I design things". I think it's pretty darn adorable. And the blue matches the stripes in the plaid quite well. It's called an Owl brooch but it looks more like a songbird to me. Thanks sister! Cute all around! That dress fits you very well. Brr at the temperatures though. I'm not sure you could convince me to go outside with weather that cold. What a great gift from your sis. I agree it does have a songbird feel to it. Happy New Year Megan! 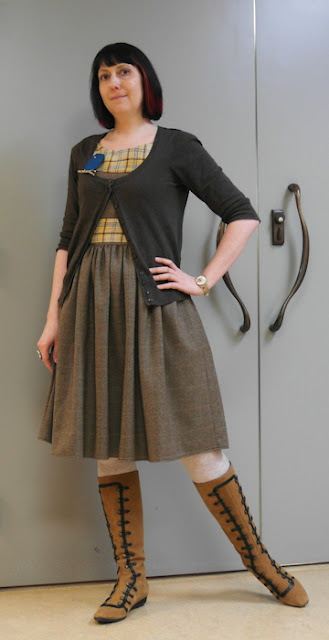 That brooch is sooo adorable, and the boots are pretty fantabulous too. Gorgeous dress! I love the plaid with the buttony-goodness of the boots, and that bird is so dear. We were just -12C here, but unheated barn, open door for light, and wind chill made for D: outfit photos, lol. Pockets to the rescue for sure! 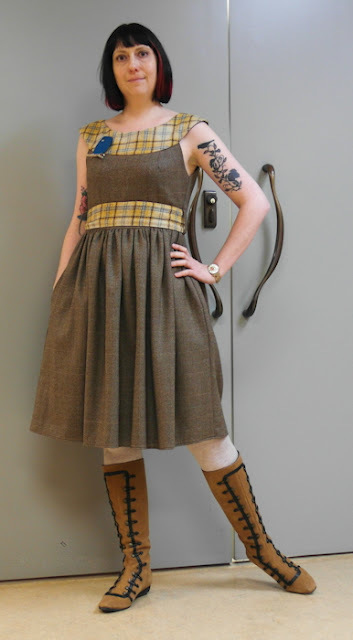 That is a lovely dress and the boots are so cool! 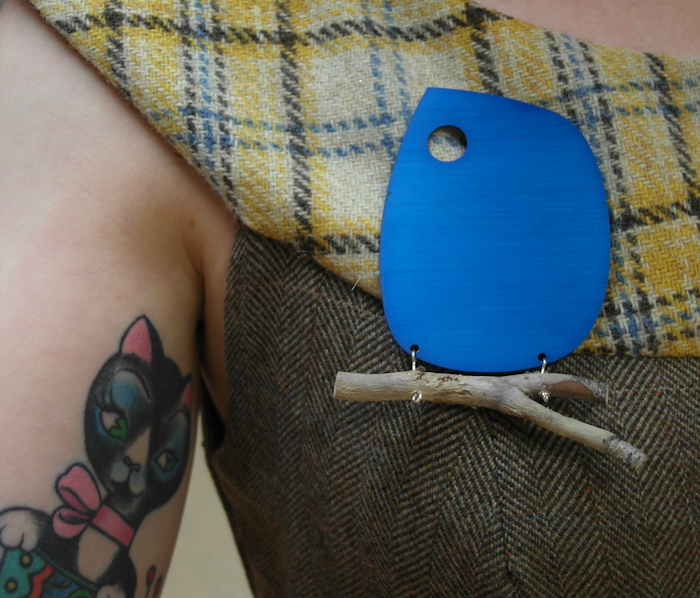 The brooch reminds me of a little fat Twitter bird. And here I was thinking "oh woe, it's going down to -1 tonight" - lol! We have it easy! Your New Year's sounds great. Happy 2013! I love the dress, but I really love the brooch even more! I love all things bird!! I agree it kind of says songbird, which is just awesome to me. Very lovely! Can I echo Ally's brrrrrr! You are looking lovely despite the cold. I like how the birdie picks (pecks?) out the blue in the plaid. I adore the dress. I'm wildly jealous of your shoe collection.